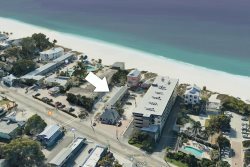 Estero Island Beach Villas #105 is a breathtaking 2-bedroom 2-bathroom, open concept condo located on the popular northern tip of Estero Island (Fort Myers Beach). Immediately as you walking through the front door, you will become mesmerized by the picturesque views coming from almost every angle of the beach! This first level unit has beautifully tiled floors throughout the main living area and bathrooms, which pave the way to many updated features! The fully equipped kitchen has every amenity needed for an extended stay or a short getaway. The master bedroom is furnished with a king size bed, while the guest bedroom features two double beds. There is also a sleeper sofa in the living room, allowing this unit to accommodate up to 8 people. This condo also provides you with an in-unit washer and dryer, as well as covered private parking to insure a hassle-free stay! Stepping outside, you can soak up the sun at the beachfront heated pool or cookout at the BBQ grilling area! Not far from your front door, you will find the 7-mile stretch of sugar-sand beach and a tranquil nature preserve featuring a scenic boardwalk and trails! With just a short walk or a quick trolley ride (3/4 of a mile), you will be sure to enjoy downtown Times Square, the famous pier, as well as many local shops and restaurants, and island activities! Beach accommodations responded quickly and professionally to my questions. Valerie was on it! A family vacation at the beach and warm, was all my grandchildren wanted for Christmas.This was a 3 generation family vacation and this unit allowed us all room to relax and enjoy each other. We loved the quiet end of the beach but close to walk to pier and restaurants. Unit was clean. Loved screened lanai and access to beach.